8,225 watt solar kit built around a SMA inverter; innovative technology and unmatched quality. SMA put the first solar inverter on the market nearly 30 years ago. With 7.9 gigawatts of installed systems around the world, SMA is a major player in the world solar market. 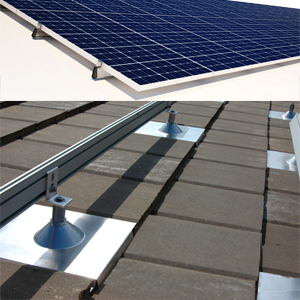 Home solar systems are just as individual the buildings and surfaces on which they are installed. We have matched 235 watt solar panels with 25 year guarantees with the right SMA inverter to give you the basic equipment to individualize your home system. 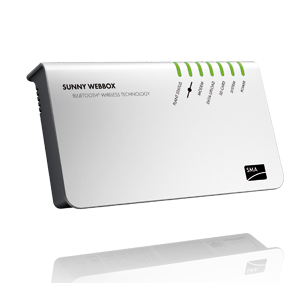 The SMA Sunny Boy line of inverters feature SMA's innovative H5 topology resulting in efficiencies of up to 98%. This high efficiency is what gives you the optimum value for home solar kit. UL listed with a service life of over 20 years, SMA inverters set the standard for quality others strive for. The SMA Sunny Boy inverters are engineered for the American markets that require UL listing and automatic grid detection. All SMA American inverters have automatic grid detection and a integrated DC disconnect switch which simplifies installation while ensuring safety and saves considerable installation time. 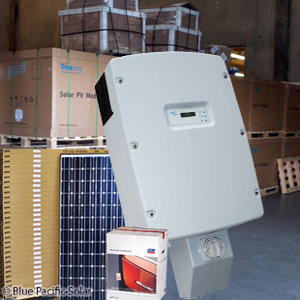 SMA inverters feature galvanic insolation and can be used with all types of mono and polycrystalline solar panels. The die-cast aluminum enclosure with the OptiCool active temperature management system guarantees the highest yields possible and a long service life even under extreme conditions. Forced cooling significantly extends the life and performance of an inverter over convection cooled inverters. 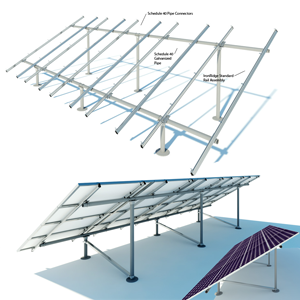 Producing over 1,235 kW per month (5 Sun Hours Per Day STC), our 8,225 watt solar grid tie system comes with 35 Astronergy, ET Solar or Talesun (Subject to Inventory Availability) 235 watt solar panels. You can buy this system with confidence Blue Pacific Solar has the support team to guide you through the installation process. Follow our simple line drawing and you will end up with an NEC (National Electric Code) compliant home solar system with a life expectancy of well over 25 years. Panels and SMA inverters are UL certified, CEC, TUV, IEC, ETL approved. In circumstances where we offer free shipping, that means dock to commercial dock (not residential) to any of the lower 48 states. If the customer does not specify a local commercial dock that is available, we will ship to the nearest terminal where the shipment will be held for will call pick up by the customer. If you choose to have your order shipped to your residence, most orders require special handling for unloading and the pallet has to be transferred to a truck with a lift gate. In most cases, truck freight companies do NOT require their drivers to unload shipments. An additional "Residential" as well as a "Lift Gate" special handling fee will apply if the driver unloads the merchandise to the curb at your residence. The special handling fee is $89.00 and is available at checkout. If you have selected this add on service, the shipping carrier will call and schedule delivery of your solar kit, (provided the weight and dimensions of the product fits the criteria for lift gate service). You can avoid the residential and lift gate fees by arranging a "Will Call" pickup at the closest freight company terminal. In that case, you will need a pickup truck, a copy of the bill of laden, and a photo ID. When you arrive at the freight company terminal, the freight company will load your order into the bed of the truck with their forklift. The most common pallet size = 65" X 44" (Height depends on Product). Be sure and check for hidden damage. Home solar 8.2 grid tied solar system or utility interactive solar system converts DC electricity from the solar panels into AC current then feeds the user's home electricity need directly. If the solar panels produce more electricity than the home requires, the excess power is pushed by the inverter back to the utility company's lines hence the name "NET Metering". A grid tied home solar system uses the utility in a similar fashion as an off-grid system might use a battery bank. Only in this case, the SMA home system pushes excess electricity to the grid during daylight hours, then draws it back during the night. The 8,225 watt (8.2) home solar system is designed to operate between 250 and 600 volts using solar panel strings that are grouped together to reach the voltage window of the basic design. Another description of grid tied central inverters is sometimes referred to a string inverter. Because grid tied inverters cannot handle storage systems by themselves such as batteries, a grid tied inverter is subject to the weakness of the local utility company power. When the utility power goes down so does the grid tied SMA inverter. This 8.2 home solar system uses pure sine wave electricity. 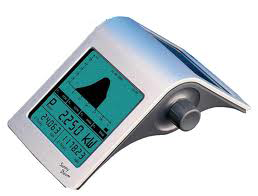 Pure sine wave electricity replicates the waveform provide by your local utility company. 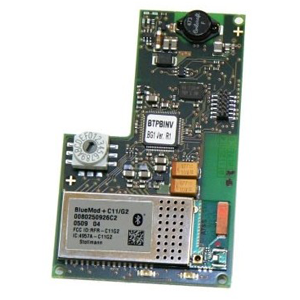 Most household appliances are designed to work with pure sine wave electricity although many will work with modified sine wave with a few exceptions. With modified sine wave electricity some appliances such as computers, television, radios and many music centers have a built in DC current reduction that will smooth out the flat wave of a modified inverter with minimal problems, but not always. Pure sine wave power is generally considered a better power source and is a requirement if the inverter is grid tied. Utility interconnection of your 8.2 home solar kit. The point at which a home's solar system interconnects with your local utility grid is often called the point of common connection or POCC. 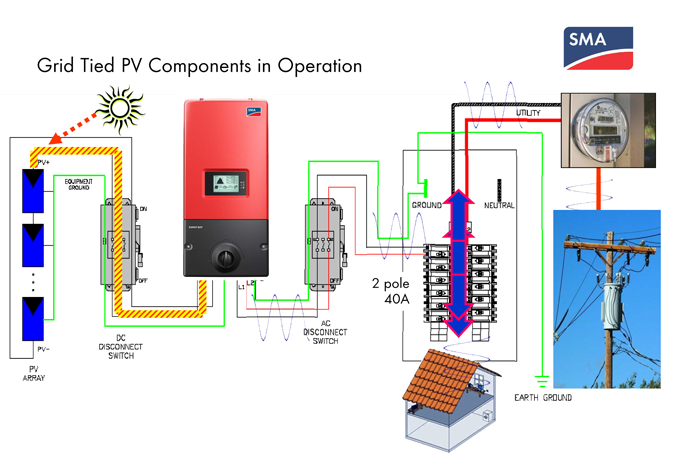 The POCC is an electrical connection that can take various forms depending on the size of the home solar system. When connecting a central or sma solar kit to the utility grid you must enter into a interconnect agreement with your utility company. A utility interconnect agreement is a simple document that states that you agree to follow their rules. Utility interconnect documents are a simple agreement with standard language making sure all customers follow the same procedures. NOTE, IMPORTANT 8,225 Watt Grid Tied Solar Kit INSTALLATION: (OK, here is the scary legal disclaimer.) It is the responsibility of the purchaser to ensure that all products are installed and operated in accordance with local and national building codes as specific by the NEC (National Electric Code), UBC (Uniform Building Code) or IBC (International Building Code) and local utility company policy. These codes may vary from city to city and county to county. All Grid-tied solar installations should be permitted and inspected, where required, by the local inspection authority in the same manner as other equivalent electrical systems. One last thing. It is always a good idea to contract with a local licensed electrician to at least do the final electrical connection of your 8,225 Watt Grid Tied Solar Kit from the AC disconnect to your home utility breaker box. Some local permitting authorities require that a licensed electrician do all the wiring from the rack to the utility interconnect. If you need help with the permitting documents for your 8,225 solar kit, we are here for you. Solar permit service add on is available at checkout. Additional Safety Instructions, Home solar 8.2 grid tied solar system; Perform all electrical installations in accordance with all applicable local electrical codes and the National Electrical Code (NEC), ANSI/NFPA 70. Be aware that only qualified personnel should install home solar 8.2 grid tied solar system. Do not attempt to repair the SMA inverter in your 8,225 Watt Solar Kit; it contains no user-serviceable parts. If it fails, please contact SMA customer service to obtain an RMA (return merchandise authorization) number and start the replacement process. Tampering with or opening the home solar 8.2 grid tied solar system will void the warranty. Before installing or using the home solar 8.2 grid tied solar system, please read all instructions and cautionary markings in the technical description and on the SMA inverter and the solar equipment. Do NOT disconnect the solar modules from the home solar 8.2 grid tied solar system without first removing AC power and DC breaker off. This home solar 8.2 grid tied solar kit is an affordable high quality solution for your energy independence.